Right after trump got elected and started folding the Jew Mickey Kaus was complaining on Twitter. He’s an Ann Coulter type who is really concerned with immigration. Someone tweeted at him asking why trump doesn’t just fire Kushner. He ominously replied that unfortunately trump wasn’t allowed to fire him. The Jew Maggie habberman even more ominously replied to Kaus “everything ok Mickey, you sure?” It was a message to shut up and an implied threat. I never see habberman pop up on anything but anti white type accounts so I was kind of surprised to see she was following the relatively obscure Kaus. It showed me that the Jews are watching everyone on Twitter from every angle. It was disturbing. In early 2014 Kaus, channeling Disraeli, told Coulter that the politics around immigration, and by implication politics generally, is all about race. This was on stage in front of a crowd at CPAC. Coulter nervously laughed it off. She urged the audience to vote republican (Trump wasn’t even on the scene yet) just one more time before making her infamous, disingenuous threat to “organize the death squads for the people who wrecked America”. Don’t want to spam your board tan but Australian senator Fraser Anning has been great on Twitter. He always posts pro white stuff but I’ve been noticing him talking about cracking down on usury as well. I bet he will be in the media crosshairs soon of ignoring him doesn’t work. On the same weekend a Black man throws a 5 year old White boy off the third floor balcony at the Mall of America, CBS releases an ad for their show ‘The Good Fight’ promoting and inciting violence against Richard Spencer and Whites. Our jew government is having hearings and House Resolutions and Bills against Whites. House Resolution 41, January 15, 2019. Senate Bill 894, March 27, 2019. House Judiciary Committee ‘Hate Crimes and the Rise of White Nationalism’, April 9, 2019. This is America today because the jews rule in America and they hate Whites. Imagine if a White guy throws a 5 year old Black kid off the third floor balcony. Instant hate speech, anti-semitism laws and criminalizing all forms of White advocacy. That’s what (((they))) want. It’s so hard to find quality commentary like this on the Jew stuff and broader White issues. In the spirit of your Tfeed sharing perhaps make a post inviting moderated suggestions on who’s worth reading or listening to? … Anglin suggests that Trump never intended to win the 2016 election or believed he could. Trump has a three decade record of of opposition to invasion, where as a New York billionaire and celebrity such a stance never did him any favours. Trump always took a populist stance on the most critical question to Americans. He could have, at any time during the election when he was dominating them, thrown the election to one of those gay guys with some disqualifying comment. He never did. I don’t think that anyone intelligent would ever have advanced these nationalist policies without knowing the electorate would have embraced them. Nick, comments making such suggestions are welcome on any post, especially from regulars whose opinion I respect. But…. This is a solid show with Patrick Little. Little, Goes into the hidden jewish hand in wars and a book (i forget the title) proving this fact. Cromwell, to The French Revolution, Russian to Germany, showing parallels to what is happening to Whites in America and by extension Whites globally. The breadth and depth of Epstein’s criminality has been and still is being actively suppressed. Trump’s association with Epstein is already known, yet the jewsmedia has yet to hammer on it, despite the fact that it “would likely cause severe and irreparable harm” to Trump. Why? Because it would also potentially harm jewing. This article talks about the Jews around trump pushing him to relocate Palestinians to Turkey, Sweden, UAE and the United States. The Jewish Telegraphic Agency combed through the report in search of Jewish links and tidbits. Here is what we found, including the story of an unusual [specifically jewy] gift that Jared Kushner received from the head of a Russian government-owned bank, the president talking about how he missed [Roy Cohn] a former lawyer who was Jewish and how the transition team tried to influence a U.N. Security Council resolution on Israeli settlements. Like Kushner and Epstein, Cohn is yet another sleazy association of Trump’s that the jewsmedia could harp on but doesn’t because it’s a specifically jewy association. No surprise, a significant portion of what the jewsmedia misreports as “Russian” is in reality just jewing. This article in the federalist makes the claim that the big problem in the Middle East is that Americans haven’t done enough for the Jews. That we have actually harmed them by giving limited support to the Palestinians. Jewish exceptionalism and the exceptionalist nature of Jewish civilization require an unconditional space for the continued evolution of their civilization. What’s good for Jewish civilization is good for humanity at large. Jewish civilization is an international treasure trove that must be protected. Beyond Blood Identities uncovers the social psychology of those who hold strong blood identities. In this highly original work, Jason D. Hill argues that strong racial, ethnic and national identities, which he refers to as ‘tribal identities,’ function according to a separatist logic that does irreparable damage to our moral lives. Drawing on scholarship in philosophy, sociology, and cultural anthropology, Hill contends that strong tribalism is a form of pathology. The Federalist article is either Hill trying to jew at 11, or trolling them to expose their willingness to jew at 11. Not sure it matters. I went to check Hill’s Twitter account, and as with Luke Ford, discovered only 4 random echo chamberites follow him. I don’t think the writer has any real power but from what I can tell the federalist types help form republican policy. I expect this to be pretty close to whatever the republican position ends up being. That Israel is owed financial reparations and a war with Iran. The jews know Cohn was totally plugged into the sleazy network of Jew York jewing, as Dershowitz is today. Trump advising the public to watch out for note-takers is, in a way, just more praise of Cohn and more criticism of McGahn. The resurrection of Cohn in the public discourse began recently with criticism of Attorney General William Barr, who was likened to Cohn and seen as a Trump henchman. Trump invoked Cohn by name. The jewsmedia has been going out of its way to avoid the topic. “…The National Socialists knew that Jesus was not a Jew and they knew that the Bible had become corrupted through the Jews, but they do not appear to have understood how this could have happened. So there we have once more the thesis that today’s Jews are somehow not identifiable with the loathsome creatures of the Old Testament (including the wholesome Israelites, presumably) who were supposedly given to disregarding their prophets’ admonitions, and that impliedly contemporary Whites are the true Israelites (of beloved memory). But again, no current genetics source cited to gainsay even (my favourite) rudimentary quote from the hemo. studies published by Mourant in 1978 in “Genetics of the Jews”. Also while I can’t be bothered checking, I thought the Canaanites were the original inhabitants whose land was stolen with the assistance of Yahweh and may indeed have been non-Semites…? Seemingly-White people sometimes surpass the stupidity even of other races. In succinct form, the quintessence of the “liberal temperament”. Not “President Kushner”, but getting warmer. 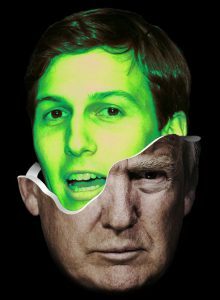 Despite his dominant role in the administration, and how prominently he figured in the Mueller report, the jewsmedia won’t even call Kushner nasty names, much less accuse him of wrong-doing. Why would they? All he’s doing is jewing. According to the Merneptah Stele, israel was wiped out before 1200 BC, “their seed is no more”. The “sea peoples” wrecked all the Levant and Eastern Med about 1200 BC ( except Egypt). The cities of the Levant were empty and abandoned. I think the Habiru Zagaze ( hebrews, jews) just moved in to those empty cities , ” God gave us this place”. As to ppl petting tigers, it just shows the power of mass media to put ppl in a world of illusion. A woman assigned to the US consulate in Delhi did same thing, surgeons could not reattach her arm, it was lost. She only survived because zookeepers rushed to drive the tiger back, he was pulling her through the bars. The (((media))) has made our ppl delusional. As to Jared, he doesn’t seem to be anything but a relay boy for his father Charles and others. Jared serves as a courier for instructions from above, a good boy. They’re a criminal gang. They know it. They act like it. The goyim in positions to thwart the criminal part understand the gang part well enough to avoid getting in the way of any of it. I would think, having over 500 years of forewarning, Whites would have taken countermeasures to that. Instead , they just lazily drift down river, headed for the waterfall. I love the two highlighted paragraphs in this article. A great analysis of their behavior. Saved to my hard drive it was. All is not lost though. Here is a strong glimmer of hope. A grand jury has or is being assembled (they don’t know) to hear facts regarding 9-11. Two half-hour presentations. Richard Gage is exuberant. The ultimate outcome? Netanyahu hanging from a noose.